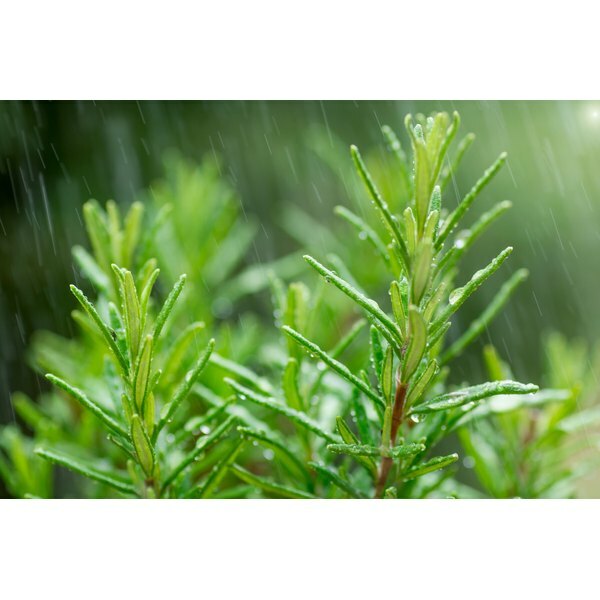 Rosemary plants receive a watering in a garden. 1 What Are the Benefits of Parsley? Many people enjoy boosting the flavor of their foods with salt, spices and herbs. Herbs can be used fresh or dried to add zest to dishes; some herbs also add nutrients such as zinc to your diet. The amount of zinc found in herbs is typically small, yet contributes to the daily requirement provided by a well-balanced diet. Parsley is a common herb used both as a garnish and a flavoring for food. One tbsp. of dried parsley introduces 0.09 mg of zinc into your diet. Because you need 8 to 11 mg of this mineral each day, pair parsley with other zinc-rich foods, including beef shanks, pork shoulder or tenderloin, chicken legs and chickpeas. Zinc positively influences your body's ability to heal after you sustain an injury, so make sure you get the full amount of zinc you need each day for this purpose. Eat a 1-tbsp. serving of fresh rosemary and you consume 0.02 mg of zinc. Supplement your zinc intake by adding rosemary to pork, chicken breast and fish such as flounder or sole, all of which also provide zinc. Consuming enough zinc is not only linked to good health for you, but is particularly important during pregnancy as it helps support fetal growth. During pregnancy, a woman needs an intake of 11 mg of zinc daily. One tbsp. of dried sage contains 0.09 mg of zinc. Including sage and richer zinc sources in your diet may provide benefits when you need to stimulate your appetite. A study published in the August 2011 issue of the journal "Recent Patents on Food, Nutrition and Agriculture" indicates that zinc effectively boosts food intake. Researchers suggest that a zinc deficiency may correlate to anorexia, although more studies are needed to confirm this finding. Dill, an herb with a tangy flavor, is another source of zinc, with 0.1 mg per tbsp. of dried herb. Boost your intake of zinc by flavoring zinc-rich foods such as peas and cheese with dill. Increasing your zinc intake may be beneficial if you and your partner are trying to conceive as zinc contributes to sperm quality. Research featured in the June 2011 issue of "Systems Biology in Reproductive Medicine" notes that a zinc deficiency leads to reduced sperm motility and quantity as well as decreased fertility. This study was carried out in animal models, so more research is needed to determine the amount of zinc needed to affect this benefit in humans. Upping zinc intake by adding herbs such as dill to other foods with zinc is one way to increase intake enough to reap possible benefits. A 1-tbsp. serving of dried chervil, an herb that imparts a slight licorice aroma, contains 0.1 mg of zinc. 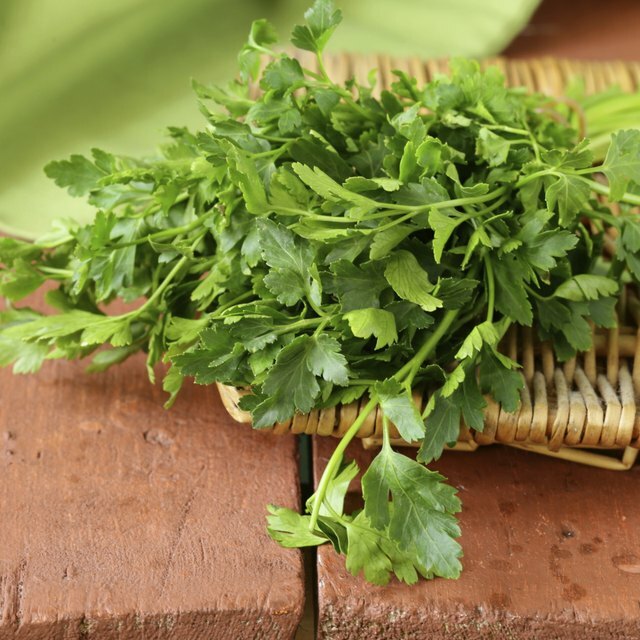 Zinc deficiencies can trigger a range of symptoms, so the zinc available in chervil can contribute to meeting the daily intake necessary to avoid deficiency-related maladies. These include skin lesions, stunted growth and cognitive problems associated with not getting enough of this critical mineral.